You’ve heard people say, “Oh, my family’s been in California for three generations.” What if you could say, “Oh, my family’s been here for eons”? Well, then you’d be a native California PLANT. And you’d love the cooler weather we’re now having here in Sonoma County, the longer, dewy nights, the winter rains. You’d be thriving, turning greener, sending out new growth, even blooming! It’s because you were born and raised here, and it’s what you expect—six months of sporadic rain and six months of drought. You’re in your element! 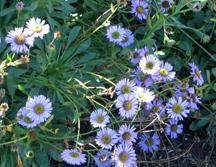 Have you noticed the Erigeron glaucus (Seaside Daisy)? Perking up with mounded green foliage, perhaps blooming; the berries on the Heteromeles arbutifolia (Toyon) turning their bright holiday red. And Sidalcea malviflora (Checkerbloom)? Prospering, producing those beautiful dark rose mallow-like flowers, weaving their stems with new shiny green leaves in and around your other plants. The Fremontodendron (Flannel Bush) sending out tiny new green leaves, gaining height, all in anticipation of a spectacular display of large yellow hollyhock-like blooms in the spring and summer. The ornamental grasses, Festuca idahoensis and californica, happy and greening up, as well as our state grass, Nassella pulchra (Purple Needlegrass), standing taller and greener after a golden summer dormancy? Why? Because they are all California natives, and for many, this is now their time to show-off or prepare to. It’s also just about the best time to plant them in your gardens—fall is the very best time, with early winter still good. Why? Because they thrive in Sonoma County, and if you begin to establish them right now (fewer shoots, more roots), they will adapt to garden conditions and do well through the droughty summer months. Planting now also produces more new growth and more flowers than planting later on. 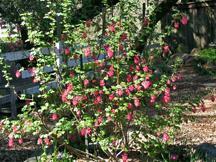 Myths abound about native plants, i.e. they all turn brown and look weedy, or just plant ‘em and forget about ‘em. Neither is really true; however, there are some caveats. Many natives are naturally dormant during the hot, dry summer months; some of the grasses will turn golden, and some of the flowering plants will have fewer blooms. In some instances, you can counteract the summer dormancy by giving them a bit of water, but as mentioned above, once well-established, many simply do not want much extra water. But by then, your other perennials have begun to bloom and provide cover for some of the dormant species. And natives, as with any plants, do require some attention, such as occasional deadheading to prolong bloom, judicious pruning to maintain shape, and some occasional water during winter dry spells. And remember, these natives have developed an interdependent relationship with butterflies, bees, other insects, and birds over the centuries and are among the very best habitat plants for your garden. Arctostaphylos species (Manzanita)--evergreen shrubs and groundcovers, a chaparral plant with wide growing range; does not tolerate alkaline soils; handsome bark, blooms and berries; many bloom in winter. Once established, these plants add a lush element to the landscape and garden. 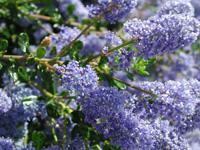 Ceanothus species (Wild Lilac)--tiny dark green leaves, mostly blue and purple flowers in spring; many varieties from ground cover to tall shrubs and trees. Epilobium species (California Fuchsia, formerly Zauschneria)-- summer dormant, breaks into spectacular bloom in late summer and early fall with brilliant salmon to red-orange tubular flowers. A hummingbird favorite. Erigeron glaucus (Seaside Daisy)--takes some water during hottest months; 1” lavender, white or rose colored daisy-like disk flowers, can bloom virtually year-round. Great butterfly plant. Eriogonum giganteum (St. Catherine’s Lace or Giant Buckwheat)--one of the most spectacular at 4-8’ high and 6-10’ wide with silvery green leaves and intricate inflorescences up to 2’ across. Flowers are excellent for indoor dried arrangements. Eriogonum grande var rubescens (Red-flowered Buckwheat)--a shorter cousin at 1-3’ high with dark rosy button-like flowers. Deadheading helps appearance. Heteromeles arbutifolia, (Toyon, sometimes Christmas Berry)--a beautiful larger shrub to 6-8 ft high by 3-5 ft across, with shiny green leaves, dark red bark, white flowers in summer, and red berries in fall/winter. Deer resistant after the first 3-4 years. Iris douglasiana, takes some water and shade in hottest parts of county, new sword-shaped fans of leaves show up in autumn, with a wide array of pastel blossoms appearing in late winter or early spring, generally long-lived. Nassella pulchra, a cool season perennial grass forming inflorescences in late winter, turns golden as temperatures rise and soil dries out. Penstemon heterophyllus (Foothills Penstemon)--tolerates some heavy soil and summer water, 1-3’ high, electric blue tubular flowers in spring and summer. 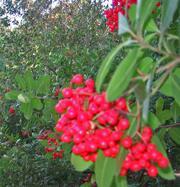 Rhamnus californica (Coffeeberry)--evergreen shrub to 6-8 ft. Dark green foliage with reddish tints; red berries turning black. Reasonably deer resistant, drought tolerant after established. Good for hedging or screening. Ribes Sanguineum (Red flowering currant)--dazzling clusters of flowers, white to deep pink to cherry, black berries in fall; light shade. 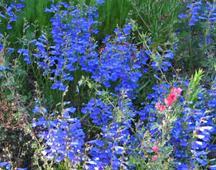 Salvia clevelandii (and others), 3-5’ high, likes hottest, driest, sunniest spot in garden; vibrant violet-blue whorled, fragrant flowers. Sisyrinchium bellum, (Blue-eyed grass--there’s yellow too))--not a grass though foliage is similar in appearance, colonizes easily; goes summer dormant, blooms in spring. Bornstein, Fross, O’Brien, California Native Plants for the Garden, 2005. Lowry, Judith Larner, Gardening with a Wild Heart, 1999. Smith, M. Nevin, Native Treasures, 2006.